To My Son, I Bequeath this Cast-Iron-Skillet… to You! Cast iron cookware, more specifically the “cast iron skillet” has been around for ages. Today’s lunch was a prelude to dinner as Fredrick was not amenable to a simple kale salad. To appease his carnivorous appetite, I decided to quickly prepare a few lamb chops and to do so using my cast iron skillet. I dressed the chops while the skillet was warming. Freshly ground black pepper, salt, crushed garlic and dried rosemary. Covering the seasoned chops with some extra virgin olive oil, I gently massaged each chop making sure to work in the seasonings. 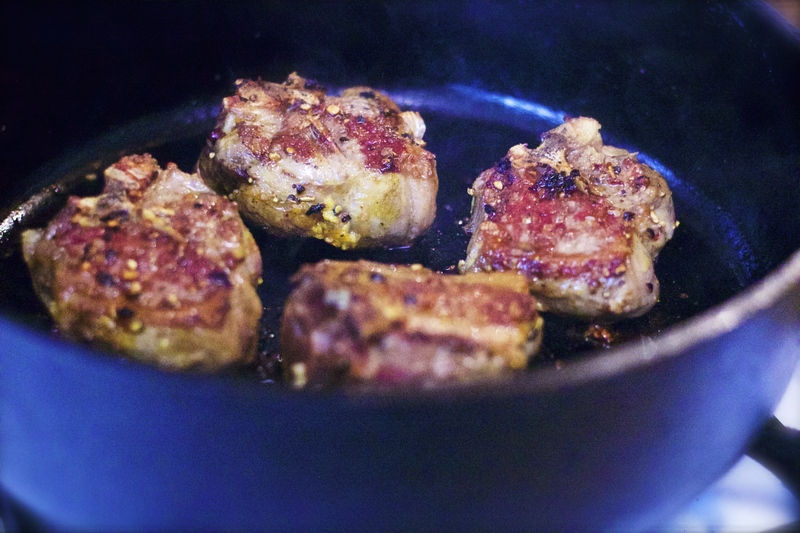 Finally, a sprinkle of turmeric and I carefully placed the oiled chops into a searing hot, cast iron skillet. Wow… The sizzle was a symphony of perfect notes singing, “Don’t touch me now,” in my TINY KITCHEN. With clear eyes, I now embrace this masterpiece of a lunch. Beautiful lamb chops with the perfect sear and medium well-done for Fredrick… (My preference is medium rare). Again, in a TINYKITCHEN anyone can create GREATTASTE when your springboard is a BIGHEART.